With a combined 85 years oh hairdressing experience, there isn't much they don't know about curly hair: so I would like to introduce our curly hair stars. We spend time training because we know that curly hair is an art in itself. Even with such a large amount of experience - our team always are learning new skills, and there is always a new product to help with curly hair, from our amazing partner Matrix. Shaun worked in London for over 10 years at one of London's top salons. His skills are amazing with afro hair and very difficult hair all lengths. If you think you are a challenge hair wise - Shaun is your go to guy! He is also the salon's creative specialist, so your curls will be managed and you'll look better than ever before. 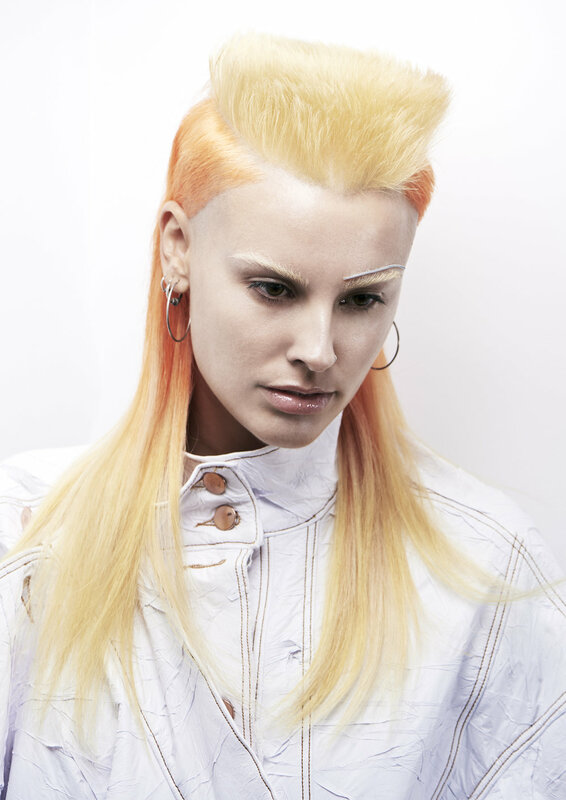 Dave hails from Scotland, he was the head educator for Vidal Sasson in London and also was one of the first educators for Toni & Guy - back in the day when he used to cut hair by candlelight. Dave has great experience with all kinds of curls. Dave understand how the silhouette of your hair works with your head shape - so he'll make even the trickiest hair curls and lengths fabulous. Jyle has travelled all the way from Newcastle and has been with Stevie English Hair for over 7 years. He's is a huge fan of soft curls he knows when to cut and when not to, his style is gentle and approaches every clients hair individually. Sadie originally from England, knows all about troublesome curly, frizzy hair, as she has lived with it all her life. Sadie's secret is all about hydrating curls. She has knack for creating beautiful shapes with soft curls, and also is not afraid to add a big bouncy blow dry. What products should I use with my curls ? Curl Please - which is a curly hair regime - A Shampoo and a Conditioner, and then use either the contouring lotion - to boost body bounce and shine, or the super de-frizzer - a lightweight strong hold for definition and frizz control . From R&Co. Twister is a great styling product. 1. Only put in curl products in when the hair is soaking wet. 3. Avoid razoring curly hair. APPLE IPHONE X HAS FACE RECOGNITION. YOU BETTER HAVE GOOD HAIR! Will you phone want to recognise you if you're hair is bad? So why not pop in and have a chat with one of our super stylists so we can make more than your phone recognise you. Did you know we have stylists who just cut! Stevie himself just colours and does that globally for Matrix. We have hair extension specialists who love to add length or volume to your hair, and we always use Showpony. At Stevie English Hair, we believe love is love. Just as everybody’s hair has the same rights to be fabulous, we feel everyone should be allowed to make someone else feel fabulous and get married if they want. We like to think everyone we know thinks the same way, so much so, if you show us your Instagram / Facebook photo with you and your YES to gay marriage we will give you 20% off hair services of course the usual terms and conditions apply. Best Hair Salon in Sydney! Don't believe us its on the Radio. It's been a while since one of these- 2 years to be precise. A fair bit has changed in that time, including the cost of just about everything involved in running a business. Effective immediately, we are implementing a 5% price increase across all salon services. Thankyou for your continued and loyal patronage and we look forward to servicing our wonderful clients for many years to come. Here at Stevie English we do A LOT of colour. All day, every day, we paint, foil, lighten, tone and create beautiful colours on our wonderful clients. All of our staff are talented colourists, and they all have their favourite things to do in the salon. Sadie is our English rose, and she LOVES colouring blonde hair. She is excellent at precision foiling, balayage, full head powder lightening and corrective toning. Sadie is also a Showpony Hair Extensions specialist and can colour match any head of hair to suit their amazing human hair extensions. It goes without saying that her cutting and finishing skills are on point, but we will say it anyway- her cutting and finishing skills are on point. At Stevie English we always recommend Matrix Bond Ultim8 - a bond restructuring treatment that holds and re-builds bonds even in hair that is super damaged. For blondes and people who lighten their hair, this is a saviour product that can keep your hair in tip-top healthy condition. Sadie is a big fan. Shaun McGrath has made finalist for Australian Avant Garde Hairdresser again, this is the second year running our creative specialist has made this prestigious honour. We wish him and the other guys who are nominated good luck. It’s hairdressing awards season again, and this year Stevie has been nominated as one of six finalists in the Creative Colour of the Year category at the Australian Hair Fashion Awards. Our superstar apprentice Louise Williamson is finalist for Apprentice of the Year, and director and creative specialist Shaun McGrath for Avant Garde Hairdresser of the Year. Louise has had a big year already, as she is also in contention to win the same award at the HBIA Forum on March 26th, and is finalist in the Rising Star category. Hairdressing awards are a big part of out industry and every category is very competitive, so we are proud of all of our team’s hard work. Awards are a great chance for hairdressers to push the boat out creatively and come up with some truly amazing hair creations. Here at Stevie English Hair, we were lucky enough to be asked to be ambassadors of a revolutionary new product called Olaplex. Lucky because we got a chance to play with the product before it is officially available in Australia, and it comes with some pretty big promises: that you can lighten your hair without damage, or in fact improve the condition of the hair. As a professional hair colourist of 20+ years, I have never heard of a product that could deliver on that kind of promise, so naturally I was well keen to get my hands on it. Olaplex is a 3-step system that consists of Bond Multiplier, Bond Perfecter and a take home Hair Perfector. The basic premise is that the product multiplies the bonds that are broken by lifting or depositing colour on the hair, thus preventing breakage and other damage. The first product can be added to any colour, powder lightener or perm solution, the second step is applied after rinsing & the third used at home. Powder Lightener/bleach has always been my best friend and my worse enemy. You can do amazing things with it, but it damages hair! So when a product claims to turn your colour world upside down, you can imagine me being extremely nervous the first time I used Olaplex! But also so excited! I was lightening one of my stylist’s hair- she had previously had lots of breakage and her ends were pretty well fried. Her hair was a patchwork quilt. And this would normally be put in the too hard basket unless you want an inch blonde crop. After reading the directions seven times, I mixed up powder lightener, bumped up the developer level (ARGHHHH), added the Olaplex and went in. I did strand tests every 5 minutes, and basically hovered behind the chair the entire time the colour was on her hair (sweating). At the basin- no breakage! After the second step was applied, the hair felt even better, it turned to silk. I could not believe her ends survived- I would never have tried to lighten them without the Olpalex’s promise. Since that first colour, I have used Olaplex pretty much every day - my team have also been blown away by the results they can achieve without damaging the hair. The product completely delivers on its promise and I don’t know any colourist who would not be excited about a product that can do this. There is an extra fee but its so worth it! Never have i been able to guarantee hair in this way. We believe that their are 3 main ingredients to becoming a great hairdresser. Stevie English Hair presents a tongue in cheek, James Bond themed Show. Who like's gadgets? Because Q gives us the best! But we will shake and maybe stir the way you think about hair, and education. Hair is art, and art is hair- We make both! We are in the Look and Learn Auditorium at 11 on Monday, come check our amazing team out. Happy New Year from Glebe and Bondi! Wow! 2012 has been a massive and fantastic year at Stevie English Hair. I hope it's been great for you too! We celebrated 5 years in our Glebe salon, on Glebe Point Rd, and opened our new Bondi Salon on Bronte Rd. We have welcomed some great new talent to our salons and am so pleased to have a loyal and skilled team who developed their skills throughout the year and done some fantastic hair for our clients! Stephen from our Bondi Salon won @hairExpo Apprentice Student Cutter of the Year! For the second Year running. Stephen was chosen to be on the rising star stage. All of our collections got published. Stevie Educated in every state. Presented on how to use Social Media in your business for Hairdressers. We were a finalist in the City of Sydney Business Awards. Again! Woo, hoo!! Competed in a few competitions. We did ok! Did some hair for the Woolmark Fashion Show at the Royal Easter Show. Elly was the Director. Go Elly! Wow! What a year. Trust me there was more! But we couldn't have done it all without the most important people. YOU! Our fantastic clients, who inspire us to do our very best work to you everyday. From our team at Glebe and Bondi, Happy New Year! We wish you the best for 2013 and fab hair to go with whatever you choose to do! If you love the Lifestyle channel then I bet you have seen Big Fat Gypsy Wedding. It’s one of lifestyles most popular shows, and I can see why. The British documentary gives us a peak into a life so far removed from what most of us experience that it’s fascinating. Apart from giving us into an insight into this travelling community and their history of religious and cultural traditions, it’s the wedding dresses, the make-up, the nails, and the hair that add up to being as Over-The-Top as possible. Big, bold, brash, colourful. It’s a fantasy of princess-like proportions. Every little girls’ (and maybe a few drag star’s) dream. The nails are long and fake. The fashion is tizzy, sparkly, frou-frou princess. It’s fabulous in a Barbie doll kind of way. But can we take inspiration from this? I’m not going to suggest that we should all get out there and be as big and brash as possible, because let’s face it, who has the time (or the budget for all that product!) but could we be inspired to take a little glam and a little sparkle into our day? A big Gypsy yes! So can you take a little Gypsy style and work it into the silly season? Of course! The trick is to take a style that many of us would think is ridiculous and translate it to cool. And this is a great time of year to try it out. ­Here are my top 5 tips to add some Gypsy magic to the Christmas season! Just take one piece of inspiration: The reason the Gypsy look is so over the top is because there is a lot, ok a massive amount of things going on, that all compete for attention. Coco Chanel famously said “Before leaving the house, a lady should stop, look in the mirror, and remove one piece of jewellery.” The Gypsy mantra would be the opposite, plus some. You can pare back the Gypsy style and just take one part of the look. Say you want to rock the Gypsy big hair. Big hair can be fabulous and a cool, cool fashion statement. But tone down everything else. Keep your make-up simple and your fashion a little more subdued. Let the fake tan fade, shorten the nails and paint them a natural pink hue. A make-under. 2. Inject some colour: Your classic Gypsy is just not seen in black. Hot pink? Yes. White satin? Yes. Some fluro with sequins? Yes. Our big cities are flooded with corporate black clothes. Bor-ring. Christmas is the time to grab some new fashion brights. Some fluro or metallic shoes, bright blue coloured jeans, a fuchsia tank top or a tangerine cardy. Maybe some bright yellow tights with that black work skirt, or a brightly coloured scarf with a classic white shirt? 3. Get some sparkle. OK, you might look (and feel) a little silly boarding public transport for your daily commute in a tiara, but a smoothed out ponytail, using a little Original Queenie to tidy any strays, and adding a crystal encrusted hair clip for the after work chrissy cocktails, is sophisticated. A weekend dinner in your black tuxedo style jacket with a crystal brooch would be stunning. A crystal or diamond set watch can be worn day in, day out for a little Gypsy bling. 4. Extend it: Gypsy hair is about big and long, but long hair needs regular love and care and just not that practical for all of us every day. If you don’t have long tresses why not try a hair piece or have extensions put in? For a special occasion a well matched hair piece can give your hair added thickness and bounce or if you would love to have longer hair for longer, extensions could be for you. Salon applied hair extensions, if well looked after, can look and feel great. They give you flexibility to have long hair instantly. In a couple of hours (instead of a couple of years) you can have hair halfway down your back. At Stevie English hair we can help you get long tresses for all your parties. We use show pony hair extensions which are the best in the business. 5. Get polished: The Gypsy style is about being “polished” and put-together all the time. If you lead a busy life it’s hard to find the time for all the “Gypsy” maintenance. I know when my clients leave my salon they feel fantastic. Nothing better than having your hair professionally done and many clients book in advance to look forward to their regular hair maintenance. But how good would it feel to have other parts of you also look fabulous? You might not like the acrylic long talons of the Gypsies but you can keep your hands and feet looking neat with a fortnightly mani-pedi. What about nourishing the body and soul with a massage once a month? How about an hour’s walk on Sunday afternoon to clear your mind and oxygenate your body, to prepare you for the week ahead? What about spending Saturday afternoon in your favourite department store trying some new make-up looks? I think Gypsy style is the perfect place to grab some glam inspiration for Christmas. Big Fat Gypsy Wedding reminds us that hair and fashion shouldn’t be serious and that we all need some colour, sparkle and fun in our lives! Tomorrow we turn 5! In some ways it feels so much longer, I can't remember not thinking about Stevie English Hair. It feels like just yesterday that we opened our Glebe store. It has been fantastic. I have so many fond memories, from building the shop with my dad, the early days with Kirsty, partying, and always doing great hair. Creating our brand. Stevie English Hair is here to stay.